OPTIONAL: 1/4 cup whey powder. The whey powder is for lift and browning but can be left out. The buns will taste the same but may not be as fluffy. In small bowl, mix together warm water, 2 teaspoons sugar, and yeast. Set aside. Put flours and xanthan gum in mixer bowl and combine well. Add the whey powder if using, the rest of the sugar, and the salt. Mix until combined well. Pour in the water/yeast mixture, the oil or melted butter, and the cider vinegar. Mix on low speed to combine and then beat on high for 3 minutes. Remove dough from bowl and knead on a floured or parchment covered counter top until it comes together nicely. Shape into a disc and slice into 9 equal portions. Take each portion and shape into a ball. Unlike many gf doughs that are a bit like cake batter, this dough is firm and easy to work with. Place the balls of dough on your baking pan. With a sharp knife, slice each top about 1/4 inch deep to make room for expansion while rising. Cover with plastic wrap or a damp tea towel and set in a warm place to rise for 45 minutes. When you are ready to bake the buns, preheat the oven to 350 degrees. Bake for 20 – 25 minutes or until the tops are nicely browned. TIP: If you want to be decadent, brush them with a bit of melted butter and sprinkle with salt when they are hot from the oven. 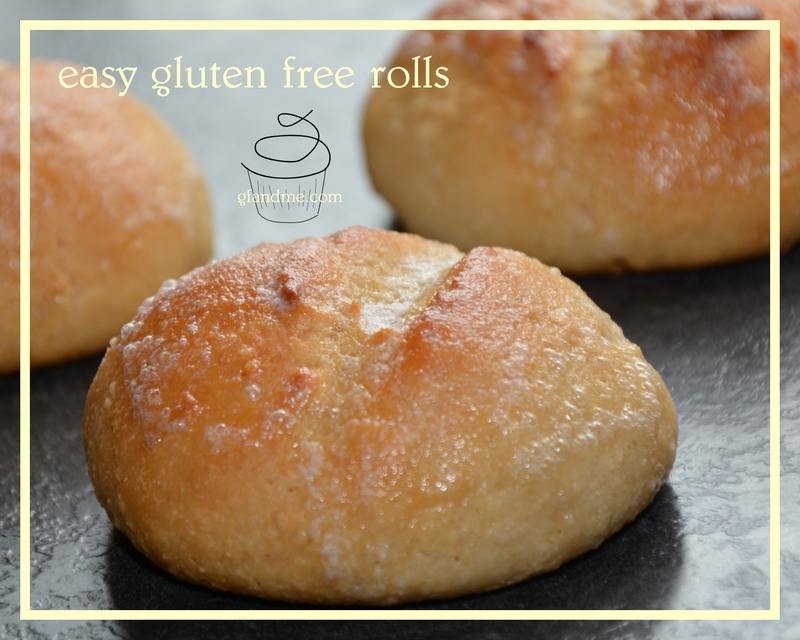 This entry was posted in Baking, Recipes and tagged almond flour, bread, dairy free, garbanzo flour, gluten free, oat flour, potato flour, tapioca flour, vegan. Bookmark the permalink. If you would print this for me I might get the flour that I need and make them. Is there a flour substitute for garbanzo flour? You could try quinoa or maybe rice flours. If you do, let me know how it works out! I would need the exchange for a family reunion in July but I will let you know how they will turn out if I have to make the change. what’s the nutrional info on these? Hi Kevin. You can get the nutritional information at http://www.caloriecount.com/cc/recipe_analysis.php. You just have to copy and paste the recipe into the box and add the number of servings.